Dreami Cremes offer every visitor coming to this amazing dining spot a dreamy menu for a fantastic dining in Branson. Beautifully located along Shepherd of the Hills Expressway, Dreami Cremes has the best of ice cream and frozen yogurt that once you have tested them, you’ll surely never forget it. As a small locally owned ice cream parlor and pastry shop, Dreami Cremes products include Dry Condensed/Evaporated Dairy Product, Ice Cream and Frozen Desserts, and much more. The flavor twist soft-serve ice cream cones at Dreami Cremes are excellent and affordably priced especially in a tourist area. You can try the cheesecake flavor on a sugar cone with a cinnamon-graham tasting flavor swirled in and mocha chocolate on waffle cone, they’re really delicious. The mouth-watering pizza and/or pastries at Dreami Cremes will make you ask for more. Many who have tasted sweet treats in this dining place have declared it the best in Branson. Their price also is unbeatable. One huge slice of pizza and a drink is only 5 bucks. Dreami Cremes serves the best pizza in town. The pizza here is prepared New York Style. Their pizzas are big and the dough is ordered from New York and the pizzas are made in this location. The dough isn’t made in Branson because of the town’s water which actually makes the crust taste weird. If you order by the slice, each piece is pretty big, like two slices in one. This dining place makes their own homemade whip cream for their hot fudge sundaes. This place use real cream cheese for the cinnamon roll frosting. If you try their White Bechamel Pie, you will truly love it, it’s just delicious. As you enjoy your stay in this great restaurant, you will find the owner and employees are so nice and attentive to your order. In addition to ice creams and shakes, Dreami Cremes also offers pastries, paninis, and BBQ. When you check this place out, you will surely be pleasantly surprised. 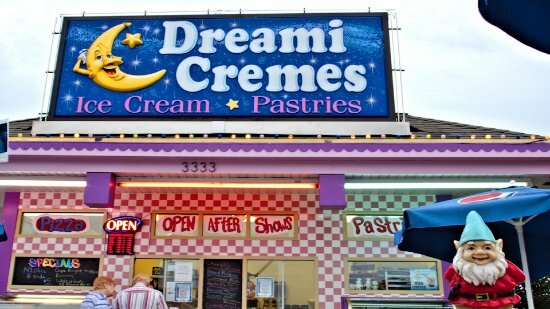 Dreami Cremes is a great little spot in Branson for some wonderful refreshing ice cream, pastry or floats. The soft serve ice cream in this place is very good and you can get them infused with flavors like green apple or butter pecan. All the pastries here are fresh and homemade. So, if you want to have a fantastic dining in Branson, try Dreami Cremes because once you have tasted their delicious food, you’re sure to come back for more.